Every weekend we dig into the archives. This post by Matt was originally published in September 2015. A presentation by Kiwirail (from page 41) to the Auckland Council Infrastructure Committee provides some interesting insight into the future of the Auckland Rail Network. Unfortunately the council don’t record the infrastructure committee and put it on online so we can’t see exactly what was said by the CEO of Kiwirail but the presentation which has been uploaded to the council website does give an indication. For the most of the presentation the slides appear to be a fairly typical business presentation talking about how they’re performing and supposedly changing their business to be more customer centric. The most interesting parts are the last four slides which highlight that there’s a lot more to do to improve the rail network than just the City Rail Link. The first of these is below and gives an indication of what needs to be addressed. The remaining slides show how the network needs to be operating within the next year or two, how it will need to be working in the future and finally how an indication of specific pieces of work needed to realise the vision along with some cost indications. 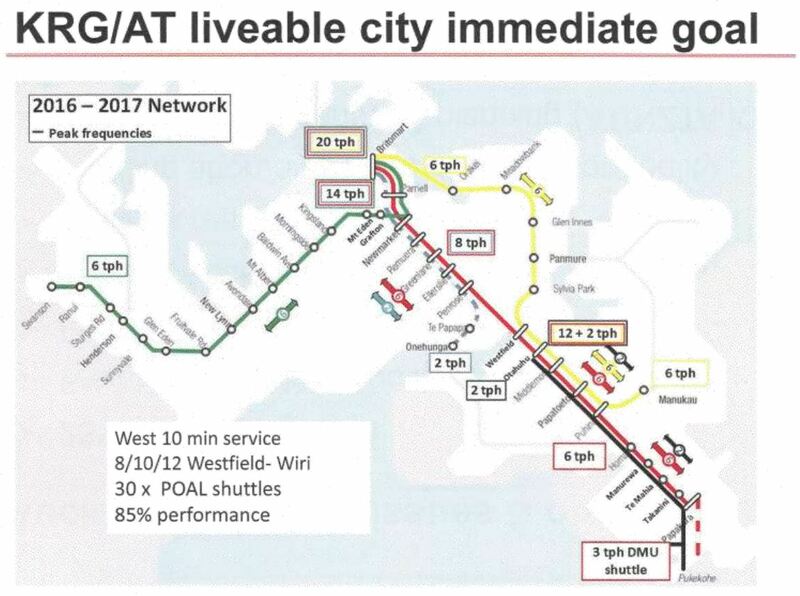 For the short term it appears the need is to get the Western Line up to 10 minute frequencies, improve network performance and get more freight trains through South Auckland. On the latter point it the image suggests at least two freight trains an hour in each direction at peaks south of Otahuhu. Moving forward to the future and by 2041 you can see a lot more trains will be on the network thanks to the City Rail Link. At peak times there would be 18 trains an hour on the Western Line in the peak direction plus 12 an hour on both the Southern and Eastern lines. There are also more trains on the Onehunga Line and more freight trains along with higher performance requirements. In a way this highlights one of the biggest benefits of the CRL, it allows us to get a lot more use out of our existing rail corridor. 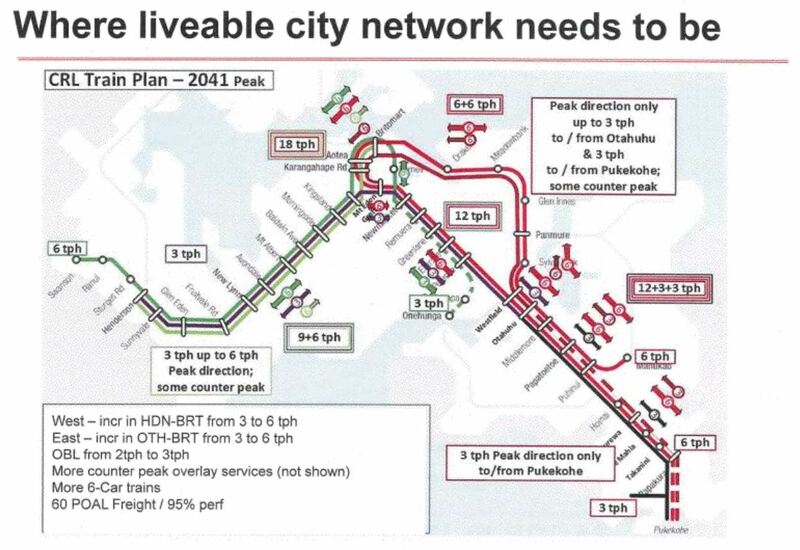 I personally remain disappointed they don’t plan on increasing frequencies past Henderson and I still feel like AT are trying to complicate the future train plan too much, especially with the Henderson to Otahuhu trains. What appears to be three different options for getting 6 car trains to Onehunga – extending the current platform, reconfiguring the station or a new platform at Neilson St. Extending the third main all the way to Pukekohe. A new Mt Smart station – this seems odd giving the close proximity to Penrose. Shifting the long distance services back to the Strand – surely this will not be good for the usage of them. Different options for reconfiguring Henderson station. To me the considerable amount of work still needed to get the rail network up to speed is reflection of the level of neglect the network suffered from for decades. Interestingly I suspect related to all of this, a week ago Auckland Transport posted this on their tender website although it has now disappeared. This RFI sets out to identify a company or individuals who will be able to best provide AT with rail infrastructure design and constructability knowledge, for on-going commissions on the Auckland rail network. Auckland Transport requires a Rail / Track geometrics, signalling and overhead line design and rail constructability consultant with at least 20 years experience in the provision of design and constructability services within a live operating environment. New Zealand experience is preferred with an intimate knowledge of the Auckland network an advantage. Experience working with KiwiRail is necessary. 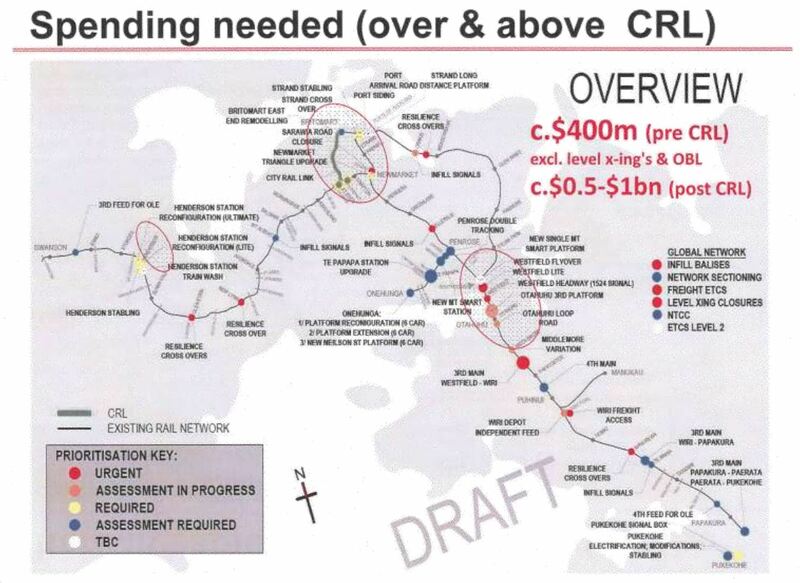 As you can see there’s a lot more than just the CRL to do to the Rail network. Three years later and I’m guessing not a lot of this actually ever happened? The first new crossover job started recently, new signals near Newmarket went in a few months ago, infill balises have popped up several times since then with more to come, 1 LX and 1 PX closed, first part of 3rd main done with the rest imminent, drainage prep work active now. The experienced rail consultant is on the job now, I believe. Several stations have been refurbished, yard expansions and relocations, Strand Scenic station done. It’s a very good time to be a rail authorised contractor. Is posting of RFI’s like that, for less than a week, standard practice? Is that what you do when legislation requires you to advertise but you already have the right candidate? Who did fill this role? For those of us living on the North Shore rail wont become a reality until there is a way of getting it over (or under ) the harbour. So there’s another matter being dragged along on a promise by politicians from election to election. How can you have a debate about the ‘Auckland Rail Network” when the North Shore residents who are paying a good amount of rates to council, are not getting any benefit from this rail system? Best way to get rail to the Shore would be to help campaign to stop wasting so much money on new roads and widened roads. Increasing road capacity like this is taking the lion’s share of the money, but will just result in more car dependency and traffic. We could be spending that money much more wisely. Yes, good point. I have been to several public meetings held over the last few years concerning NS rail. Doesn’t seem it will happen within lifetime of most or all readers of this blog. The bus based RTN is all you can expect with a small almost negligible chance of light rail. At least the area I reside has a real rail line passing right through. Cant be considered because there is a promise, just hot air so far, of a light rail in about 10 years. Although many residents here are sceptical and think thats a joke and if someting light rail happens that could be 15 to 25 years away. Most annoying there are already built rail platforms and parked up in Henderson yard are dmus that fixed up would be perfect for a swanson kumeu shuttle. And if they can get the electrification done through to Pukekohe then they could also use those DMU’s that are on that run to open up the Waiuku – Glenbrook line and make Papakura a rail transfer point for AT and the future Hamilton run . You do have a pretty good busway though – which is better than a lot of Auckland has. Not every ratepayer is going to have rail nearby. That would be a relevant comment if fuel taxes were spent exclusively on the rail network, however that’s not the case. There has been plenty of transport infrastructure built on the North Shore in the last 10 – 20 years. In the same way every other part of Auckland contributed to and now covers the cost of the busway even though it only runs through a very small part of it? I swear some people on the Shore would complain they were on fire and you pissed on them to put it out. Don’t all the people who cross the harbour each day – whether by car, ferry or bus, and whether they live north or south – use infrastructure on both sides of the harbour? I think it’s more helpful to look at the network, and make it work for all. The North Shore needs transport investment, but I’d say buslanes on all the arterials, and east-west bus routes, are what they need first. Other places have specific needs, too. On the original comments for this post, I note the thread about moving the long distance trains to the Strand. The Strand could have worked, had someone bothered to connect it. AT Journey Planner does not recognise the station as named in the website and booking information from the Northern Explorer (Auckland Strand Station, or Auckland Strand Railway Station). Similarly, typing Strand doesn’t work. Why so very, very poor? Just a shuttle bus is required from Britomart to the Strand Station prior to departure and the reverse after arrival. Just like the shuttle bus service from Wellington Railway Station and the Interislander Ferry. Yes and apparently they had one of these at one point (I would guess just after Britomart was stopped being used as the scenic line terminal). I’ve looked recently for any news about the 3rd main project but found none, including by this blog. It’d be nice to have a progress report on what’s going on with it. There isnt any news concerning the third main. I trained from NM to Pak this morning and there is absolutely nothing happening with progressing the third main. I’d expect the easy parts, fill in track around Wiri depot and south, to be the first actioned if work was started. There seems to be little interest from Kiwirail, NZTA or AT so the 3rd main, at least WtoW is probably 5 years or longer away. The rest to Puke and 4th main are probably just a pipe dream. Hopefully a sign of something being designed or planned ? Did the ‘or Avondale’ mean the Avondale to Southdown rail line as that would be the alternative to triple tracking from Newmarket. It could be from Southdown through to Avondale then going north as right now they have only 1 return freight train daily and when the new spur is up ad running there will a heck alot more freight running north . Can the Avondale Southdown line be moved up the schedule please? It is the equivalent of the Waterview Tunnel, only that it will actually decongest the roads for real. The corridor is there, the trucks dominate the northwestern motorway all day and night (I assume that at least some of these wouldn’t be required with this link). And as a passenger service who wouldn’t appreciate a direct link from Onehunga to Avondale? Two nouveau riche suburbs pulled a little closer together! And of course the eventual shortcut to the airport for Westies. Why is conversation based around a waterfront stadium and wharf extensions? Surely the people deserve a better city, for the people? Plenty of wasteful projects in the RLTP that could be canned to provide that $2 to $3 billion, and Auckland would be better off for it. After reading Wikipedia there was this item stating the following – “If the Marsden Point Branch from Oakleigh is constructed, commuter services may also operate between Ruakaka and Whangarei. These would utilise the North Auckland Line between Whangarei and Oakleigh before running down the branch to Ruakaka.” . even back in the early 70’s there was a lot of commuter traffic going both ways and then there was not much heavy industry at the point . So possibly someone from KR are now possibly thinking about the using of SA/SD carriages in other parts of the country . As KR have turn 3 SA’s into goods/staff vans for the Great train journey’s. In other rail related news, excellent news today announced by the government pushed by New Zealand First they are going to keep the EF locomotives on the NIMT and refurbish then for $40m. Great decision. Good for the environment, good for rail, good for the economy, and good for jobs. Phil Goff will probably moan as well. He was in receipt of a substantial sum of Chinese money for his mayoral election campaign. Info from other sources (CEO who just left) stated the opposite only a month ago. Sounds like the next item on kiwirails list after SIMT, Whaganui and Wairoa.